Clever Mom convinces Dad to let each cat stay for a short time, and once they’re comfy in the house, they never leave. One stray, then two, then three, and Dad is at his wit’s end. When stray cat number five moves in, Dad finally takes a surprising stand. Dog-lovers, cat-lovers, and even cat-haters, will love this funny, heart-warming book. Thanks for letting me see That Cat Can’t Stay. It’s an absolutely adorable book- and exactly how the Viorsts once wound up with four cats. Mom keeps finding stray cats and bringing them home, to Dad’s dismay. Then one day Dad visits the pound. Energetic, cartoon-like illustrations. In a comic rhyming text, the narrator tells the tale of how five cats and eventually one dog are added to a family. Mom brings home stray cat after stray cat and Dad firmly replies: “That creature cannot stay./There’s no use begging./Don’t say please./I don’t like cats. They scratch my knees./And I don’t want to have to shout,/so kindly put/that cat-thing out.” While Mom pretends to comply, she knows just how to manipulate soft-hearted Dad…. The young son and daughter witness each encounter and make the cats their own, but it is Dad that the cats prefer. Each scenario is funnier than the last with Dad ranting and raving but always relenting. Finally, Dad gets just what he wants—a sad and lonely pup he found at the pound. The book concludes with a funny family portrait, including five cats, and one dog. The cartoon style, pen and ink and watercolor illustrations are at the heart of this comedy. The exaggerated facial expressions, especially those of Dad, are laugh-out-loud funny. One reader commented how the humorous vignettes of the Dad, proclaiming why he doesn’t want another cat, kept the children entertained. Students from age four through eight greatly enjoyed this book. One second grade teacher called the book “brilliant” and said her students “loved it.” Children moved closer as the book was read and enjoyed repeating the refrain. In this light comedy, the creators of I Always, ALWAYS Get My Way again spotlight family dynamics. Energetic rhymed couplets relay how Mom and kids repeatedly bring home stray cats, driving Dad crazy. With each new arrival, he launches into a chorus of reasons why he doesn’t like cats (“They scratch my knees./ They carry fleas./ They make me sneeze./ They’re always getting stuck in trees”) and decrees that the stray must go. After tactically agreeing with her husband, manipulative Mom describes what dreadful fate will befall the feline if they don’t take it in, and Dad reluctantly relents, still insisting, futilely, “that cat can’t stay.” Parkins’s high spirited cartoons depict animals and humans with amusingly exaggerated facial expressions, especially the exasperated father who, with his multiple tantrums and ever-present shorts and sneakers, far more resembles an overgrown toddler than a patriarch. While the verse veers into doggerel territory in its bounciness, the buffoonlike father’s antics should prove kid-pleasing. Though Dad complains vehemently every time Mom brings home a stray cat, she convinces him to keep each homeless feline: “His leg is broken. He can’t walk. He’s easy pickings for a hawk.” Five cats later, Dad puts his foot down–and adopts a dog. The rollicking rhyming tale with its comical pen-and-ink and watercolor illustrations is an enjoyable read-aloud for pet lovers. My three year old was really excited to open the box to see the surprise hiding inside…..to her amazement it was a book about Cats (something she holds very dear to her heart, seeing how we have a 22lb cat at home named Rubberlips). As soon as she took the book out of the box she wanted to read it. We climbed into a comfy chair with her stuffed toy “puppy” and started the The Cat Can’t Stay adventure. She liked looking at the pictures and started to give the cats names that were quite funny: one was named Bushy, one was floppy and one was slippery and on it went. Upon reading the book twice she had already picked up some of the rhythm of the book and she could tell me the next words to come, thanks to the familiar words of the book. We reread the book again the next day and she could tell me a lot of the words again and she gave the grey kitten the name of “Smoke”; I am sure the calico will get a name at the next reading. Thanks so much for the chance to review the book and for the opportunity to smile at the funny antics of my daughter yet again. 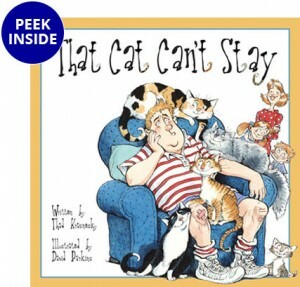 That Cat Can’t Stay is on my list of fun rhyming read-alouds for elementary students. I love sharing this title, but never stopped to think about it in context of rescue animals until I started collecting books about rescues and helping find homes for animals…. One of the best parts of this book is finding all the cat-aspects in the illustrations. The charming and whimsical illustrations are a perfect companion to the rhyming text. Dad is slightly overweight, wears huge running shoes and has messy red hair. Here’s a dad kids can relate to. Perfect for reading aloud, one group literacy activity for students is for them to imagine the other characters bringing home different animals and chant the father’s repeated objections: “I’m sure EVERYONE agrees: we can’t have ANY more of these!” The reading level is a comfortable one for second graders and the back and forth dialogue would make this a good selection for reader’s theater. That Cat Can’t Stay has a funny, rhyming text with repetition in dad’s angst-filled complaints. The story is great for building reading and listening skills as well as being just plain fun to read. My 2 and 3 year old granddaughters love the story and can finish some of the lines as well as even quote sections. The illustrations are whimsical and detailed even adding to the story as the cats become part of the family photo gallery. Part of the fun we have is spotting all the catly details in the art. That Cat Can’t Stay is a joy to read aloud. Thad Krasnesky begins with a situation familiar to many. Mom finds a cat in need of a home, but Dad forbids keeping the cat. Mom immediately sets about releasing the cat into the outdoors, while noting the rainy weather conditions facing the poor feline. Dad relents but only till the rain stops. By then, however, the kitty is a part of the family. This cycle repeats four more times as the family’s collection of kitties grows. In each instance, Dad’s objections become longer and funnier. Justice prevails, however, when a trip to the pound results in one final addition: a dog for Dad. The story concludes with the family “happy to discover. 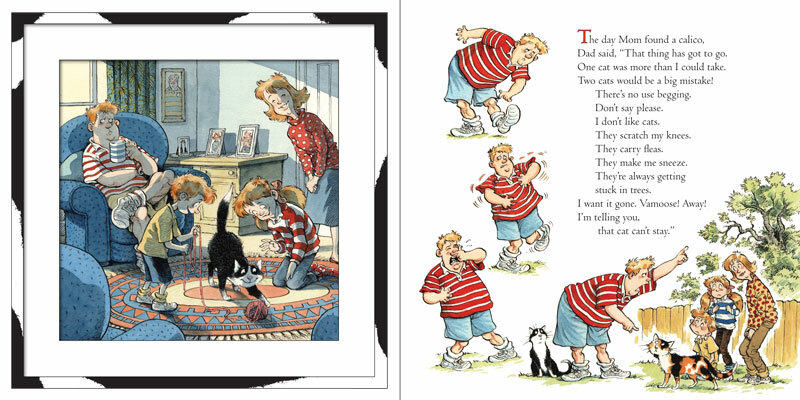 . . that Daddy is a dog lover!” Krasnesky tells his tale with rhymes and a delightful rhythm that rolls off the tongue, while David Parkins’ ink and watercolor illustrations of Dad mimicking various feline imperfections are perfectly hysterical. If your family is like mine, That Cat Can’t Stay will quickly become a favorite to be read again and again. 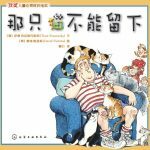 That Cat Can’t Stay wonderfully weaves humor, rhyming text, and funny illustrations to create a wonderful reading experience. Poor Dad is not a cat person nor is he a match for clever Mom, a cat lover who manages to finagle not one, not two, not three, but FOUR cats into the household. One by one she brings them home and uses different tactics to convince her husband to keep them. Each time Dad goes through a very long explanation of why the can’t stay, but Mom is able to come with a story of all the horrible things that could happen to the kitty if he/she aren’t looked after, which makes him feel guilty. I think what makes this book great are the large, exaggerated illustrations, especially of Dad’s long diatribe. The watercolor illustrations gives the book a warm, fuzzy feeling, and the ending is just priceless! A great read for pet and non-pet lovers. …The lively rhyme and comic illustrations are sure to make readers giggle, and the poor, kind-hearted dad certainly deserves the happy ending he gets. David Parkins does a wonderful job of creating engaging expressions for both cats and people. …embrace the fluff. He may rant and rave, but ultimately this softhearted dad lets the strays stay. David Parkins’ hilariously detailed pictures add to the fun and the surprise ending. Thad Krasnesky’s bouncy rhyming couplets and David Perkins’ clever cartoon illustrations make That Cat Can’t Stay a pleasure to read aloud and to hear. Kids will giggle at Mom’s clever guilt tripping of the bossy but soft-hearted dad, and will quickly pick up on his plaintive refrain as each sad kitty’s case is pleaded before him. Dog lovers, cat lovers, and even (horrors!) cat shunners will find something to laugh at in this one. Krasnesky’s rhyming text is very funny with a great rollicking flow to it. It begs to be read aloud, especially Dad’s litany of reasons he doesn’t like cats, which are sure to have children giggling since they all rhyme with one another: “They eat my cheese. They hairball wheeze. Their licking makes my stomach quease.” Parkins’ art adds a lot to the story, ensuring that the reader is charmed by the cats thanks to their friendly furriness. He uses white space with skill, changing the illustrations for Dad’s litany of cat complaints to make each one a bit more frenzied and dynamic. Recommended for cat storytimes. This is a purr-fect readaloud for any family that finds that they too seem to collect animals. I’d even recommend it happily to dog lovers. Rating: 5/5 End papers: blue with cat scratches, perhaps? Hard to say! In this rollicking, rhyming story, a cat-hating dad gets saddled with first one, then two…three…four…FIVE cats…that all come to the family in different ways. Cute, cute, cute. The illustrations – watercolor over pen and ink – are a riot, especially the dad, a plump guy who always wears short and horizontally striped short sleeved shirts. And the cats. Oh, yeah. This one’s a real winner. I want to read it aloud – to my class, to my grandkids, to my friends…. What a great picture book to read along with Hate That Cat (Creech).–Chris, 4th grade Literature teacher, southern Arizona. 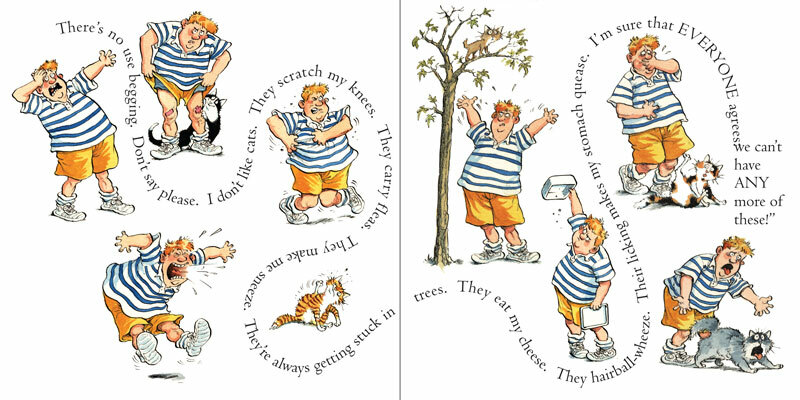 This delightful rhyming tale is as charming as it is hilarious. Dad is losing his battle with his wife and family to stop adopting stray cats that clearly love him. The illustrations portray happy cats sitting on Dad’s lap, sharing his chair and utterly adoring him. The illustrations are whimsical and laugh-out-loud funny. The surprise ending is the icing on the cake. This book is a wonderful read-aloud and perfect for families who have ever adopted a stray animal. The hardback binding is sturdy and will hold up for a long time with normal use. That Cat Can’t Stay begins on a rainy day. The mother of the narrator’s family stands in a raincoat, holding a sad-looking cat. It’s a stray and Dad doesn’t like cats, so he says, “That creature cannot stay. There’s no use begging. Don’t say please. I don’t like cats. They scratch my knees. And I don’t want to have to shout, so kindly put that cat-thing out.” Mom is tricky, though. She tells Dad she’ll just put that cat back outside in the rain and hail, no matter how drenched he’s going to get and Dad says, “Well . . . “ So begins the delightful rhyming tale of how one little family with three children adopts 4 full-grown cats in need; and, then the cat loving narrator (a daughter in pigtails) brings home a kitten in the hood of her jacket. I loved this book so much that I forced my husband to listen to it and turned the book around to show off the illustrations as if I was reading to a class of kindergarteners. That Cat Can’t Stay is one of the cutest children’s books I’ve ever had the pleasure to review. The rhyme is repetitive and catchy, the illustrations are expressive and often hilarious (the looks on those cats’ faces are a hoot — not to mention Dad, who turns out to be a softie). The book even has a funny twist when, after adopting 5 cats, the father goes to the pound and brings home a dog. Story in rhyme: 5/5 – Clever, charming, rhythmic and funny. Illustrations: 5/5 – Absolutely perfect. The entire family and all of the cats are colorful and so expressive you can’t help but smile. This is such a cheery, satisfying book that I’ve found myself wishing I had small children around whenever I read it. Flashlight Press’ newest illustrated picture book, That Cat Can’t Stay, by Thad Krasnesky, is a delightful read-aloud that could very well have you giggling all the way to the pound to adopt a cat of your own. Using reverse psychology, Mom cleverly convinces Dad to allow a stray cat (or four?) to stay for a spell. But how many felines can one family feasibly find? Reminiscent of the whimsical works by Dr. Seuss, this book’s lyrical style will undoubtedly capture and engage its little listeners; the repetitious rhyme will find them as curious as a cat to see how this tale ends. Whether you like the little fur-balls or not, the PURRfectly eye-catching, authentic illustrations by David Parkins will endear themselves as they bring this CATchy story to life. When Mom brings home a stray cat, Dad is emphatic: they are not keeping it. Mom, who could win an award for diplomacy, agrees with her husband, adding a comment about the fate of the poor kitty if left outside in the rain. Dad relents, but insists the feline be gone when the weather improves. Needless to say, the cat becomes part of the household. This scene repeats itself again and again, with Dad’s protests becoming longer and more comical, and each time a new feline joins the family (as attested by a picture showing a home scene with the appropriate number of cats). Finally, in a surprising, laugh-out-loud conclusion, Dad has his say about the pet situation. Thad Krasnesky’s wacky story begs to be read aloud. Kids will giggle at the refrain, and might begin chanting it along with the reader. David Parkins’ comic, expressive illustrations are a perfect match for the lighthearted tone of the tale.That Cat Can’t Stay joins a long line of Flashlight Press success stories. A winner all around. I can totally understand the father in That Cat Can’t Stay. That would be my view too. I am not a cat lover. I do admit, however, that the cats were cute … on paper … within the confines of the pages of this book, but no cats for me … thank you. No dogs for that matter either or rabbits or mice or birds. Well, I did have a bird when I was a child and a turtle, too, but those days are over. I admired Mom’s wily and crafty ways as she perfected her skill of wrapping Dad around her finger. That mom tugged on his heartstrings. How could Dad possible put a cat out in the rain? And that poor calico – it was going to starve to death, wasn’t it? Surely, Dad couldn’t send it to the hereafter on an empty stomach. And anyone would help a cat that was hit by a car … like the ginger kitty was. Even I would do that. So what was Dad supposed to do? Of course, he did what any good dad would … he allowed the cats to stay until the rain stopped, until the kitty was properly fed, and until ginger kitty’s leg mended. That Mom … she was a clever one! She sure was! She knew what she was doing. And those cats just stayed and stayed and stayed even though they scratched Dad’s knees, carried fleas, and ate his cheese. Poor Dad! Thad Krasnesky and David Parkins team up to make a very funny book, which will have children cheering Mom on. Kids will have fun joining in on the repetitive, rhyming parts, too. And they just might learn a little about using reverse psychology … on their own parents. “There’s a family and Mom found a cat,” said Tala. “It was a broken cat,” said Caden. “Then she found one cat in the rain,” said Daisy. “And Dad said, ‘Well, we’ll let that cat stay, but not for long,’” explained Juliana. “Mom was bringing cats back every single day,” said Caden. “But Dad did not like cats,” said Abby. “They carry fleas,” said Caden sticking up for Dad. “And they scratch his knees,” explained Brayden. Juliana nodded. “Dad probably got hurt from cats,” she said. “Then Mom would rescue another cat and Dad would say, ‘That cat can’t stay, but Mom brought the cat home anyway,’” said Juliana. “Maybe she just took the cats because she had no one to talk to,” said Lucy. Callie shook her head. “What Mom really wanted was to have a cat – lots of them,” said Callie. “But I bet she was just making Dad crazy for all the cats she was finding and saving,” she added with a giggle. “Dad always said, “Well, we’ll let that cat stay, but not for long,” said Juliana. “But … Dad, said, “Well!” said Diego as he drew out the word to sound like this, w-e-e-e-e-l-l-l. (And then the cats always stayed.) “Mom was trying to trick Dad to keep the cats – as many as she could find. She would give him a reason so she could keep the cat, but he said, ‘No’ and she still kept them,” said Tala. Brayden nodded, “Mom got all the cats by using psychology,” he said. “Reverse psychology,” proclaimed Daisy. “Reverse Psychology is like … you can trick someone,” said Tala. “To get what you want,” said Juliana. “There was a lot of reverse psychology in this book.” “I think the Mom was pretty smart,” said Mikaela. “She kept going with what the father said so he would feel guilty and then she could keep the cat,” she explained. “Mom was trying to convince Dad,” said Lucy. Caden shook his head. “But Dad wants the cats outside,” he said. “I like how the mother uses reverse psychology to get what she wants,” said Juliana. “The mother is really, really good at doing that.” “I wish my mom would do reverse psychology … on my dad,” said Lucy with a smile and a giggle. …Thad Krasnesky’s wacky story begs to be read aloud. Kids will giggle at the refrain, and might begin chanting it along with the reader. David Parkins’ comic, expressive illustrations are a perfect match for the lighthearted tone of the tale. That Cat Can’t Stay joins a long line of Flashlight Press success stories. A winner all around. 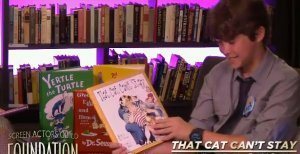 Thad Krasnesky is the author of I Always, ALWAYS Get My Way, That Cat Can’t Stay, illustrated by David Parkins, and the upcoming Pterodactyl Show and Tell. 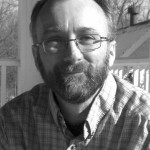 Thad is a writer of children’s stories trapped in the body of an Army major. He served five tours of duty in Iraq and Afghanistan, and was an instructor at the U. S. Military Academy at West Point. He enjoys volunteering with children and running marathons, and lives in Lansing, Kansas, with his wife and two daughters. 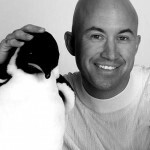 David Parkins is the illustrator of I Always, ALWAYS Get My Way and That Cat Can’t Stay, written by Thad Krasnesky. David has been an illustrator since he left art college in 1978. He spent several years at the beginning of his career producing textbook illustrations for educational publishers. He also worked for the publishers of the British children’s comic book, The Beano, an institution in the UK. 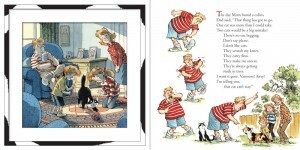 Until recently, David drew their main character, Dennis the Menace (not to be confused with the American character of the same name, although they are almost exact contemporaries). In addition, David has done political cartoons and editorial illustrations for The Guardian, The Globe and Mail, Nature, and the Times Educational Supplement. In his nearly 40-year career, David has illustrated scores of books, poetry anthologies, and covers. David moved from Lincoln, England, to Lansdowne in Ontario, Canada, where he lives with his wife and daughter, and their cats. Read more about David and see some of his artwork on his personal website. Error: Error validating access token: Session has expired on Sunday, 23-Sep-18 01:36:16 PDT. The current time is Friday, 26-Apr-19 01:03:52 PDT.